How long would you last if your water supply was cut off? Hurricanes, earthquakes, floods… they happen. And you never know when the next one’s gonna hit. It’s not only about how much water you’re storing. It’s also about where and how you’re storing it. You don’t keep your water in plastic bottles, do you? They’re NOT good for long-term water storage. Normal plastic will contaminate your drinking water with BPA chemicals. Plastic bottles should only be used in an emergency. Still, there are some things that I didn’t like about the design of the Waterbrick. 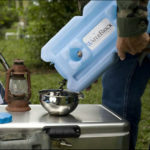 Waterbrick’s a fantastic water storage container, but it’s not cheap.You can get better bang for your buck elsewhere. Waterbrick is the best water container for certain situations. You have limited space for storing your water. You’ll thank yourself later for not filling your apartment up with water canisters. You need a versatile container that can store food, ammo, water and ice. Go for it – no other container can do that. Waterbricks can also be used for brewing beer and wine. Or if you want your water supply to be stackable. And if that’s not the case – then Waterbrick is not worth the money that you’d be paying for it. 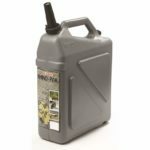 For the best bang for your buck, you’re better off going for an Aqua-tainer 5.5 Gal or a Reliance Rhino 5.5 Gal water containers. Both of these are heavier and harder to carry than the Waterbrick. You can’t store food/ammo in them. But if all you need is a good basic water storage container… they’ll do the job and they’ll do it well. If you want your water supply to last you for months, take a look at 55 gallon water barrels instead. Easily the best cost per gallon on the market. 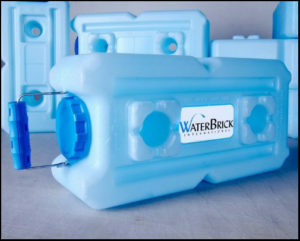 One standard Waterbrick unit is 9 inches wide, 18 inches long, and 6 inches high. It’s small enough to fit into all kinds of spaces around your home. Small size = Waterbrick is a great choice for apartments. You can stack Waterbricks on top of each other – like Legos . Stable construction: there is zero risk of your water supply falling/rolling/moving around. Wider stacks can be made even higher (people have managed up to 7 feet). 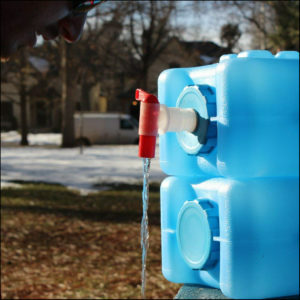 One Waterbrick holds 3.5 gallons of water. It’s one day’s water supply for 3 people… with a little extra that you can use for washing or cooking. When filled, a Waterbrick will weigh 29 lbs. The smaller size makes Waterbricks easy to carry and move around. This difference will add up over long distances. But… you’ll also be storing less water per container. 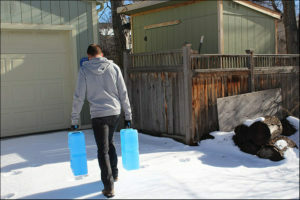 Personally, I prefer the versatility over size (in case I need to move my water supply fast – Waterbrick lets me do it). You can also use it to brew beer and wine (if that’s your thing) or use it to store ice. By now you’re probably wondering – how can a plastic container hold 120 pounds of ammo and not break? Where’s the catch? 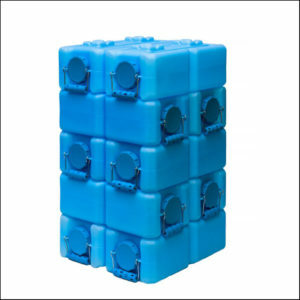 Waterbricks are made out of HDPE resin(High Density Polyethylene Resin). It’s BPA-free food-grade material and feels like something that a canoe or a kayak would be made of. HDPE Resin is extremely sturdy. It has a very tough, durable feeling when you touch it. It’s not your normal plastic. The walls of the brick are 3/32 of an inch thick – enough to survive an airdrop. Waterbrick is safe to use in temperatures from -104 F to 230 F.
You can freeze it – and it’ll be fine. Just make sure to leave some space for the water to expand. Waterbricks are made in America. (Side Note: they’re based in Clinton, Iowa). I don’t know about you, but… I’m happy knowing that I’m not keeping my water supply in Chinese plastic. Every Waterbrick comes with a 5-year warranty. I contacted them and they confirmed that under normal circumstances the unit will last you much longer than 5 years. The unit has a large wide-mouth lid with a rubber gasket to prevent leaking. Easy to use – just unscrew and pour. The lid is very wide: 3¼ inches in diameter. Note: You’ll need to screw the lid down real tight to prevent the unit from leaking. It’ll take you a little getting used to. The position of the lid. It’s in the middle of the container. The water flows well in the beginning, both with and without the spigot. But once the water gets to about 30%… you’ll have to tilt the unit to get to the rest of the water. Not a dealbreaker – it’s just annoying. So, I did some research and found a workaround: Super Easy Siphon. Just get one of these with your Waterbricks and you’ll have no trouble getting all of the water out without tilting or shaking them. There is a spigot for Waterbrick that you buy separately. It replaces the cap and is much better for getting the water out of the container. Getting at least one of those spigots is highly recommended. It will make getting the water out of the Waterbrick way easier. 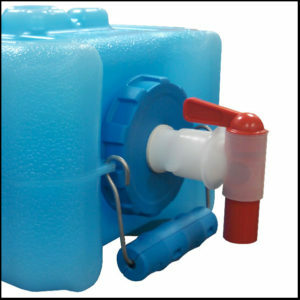 Each Waterbrick has a detachable handle attached to it. This makes it very easy to carry the unit around. What I mean is…have you ever tried lugging one of these huge 5-gallon water-cooler-canisters somewhere? You might run out of your water supplies at some point. When that happens, you’ll want to have a water container that you can carry around easily. You can get the Waterbrick in two colors: light-blue and tan. Absolutely no difference between the tan and the blue Waterbricks. Both are equally good for water storage. The tan ones are created for camo industry buyers – they’re harder to spot from the distance (in case you need to hide them). Side note: I got myself a 10-pack of tan Waterbricks… they’re less eye-catching and I can stash them in them forest if necessary. Waterbrick comes in 2 sizes: 3.5 gallons and 1.6 gallons. 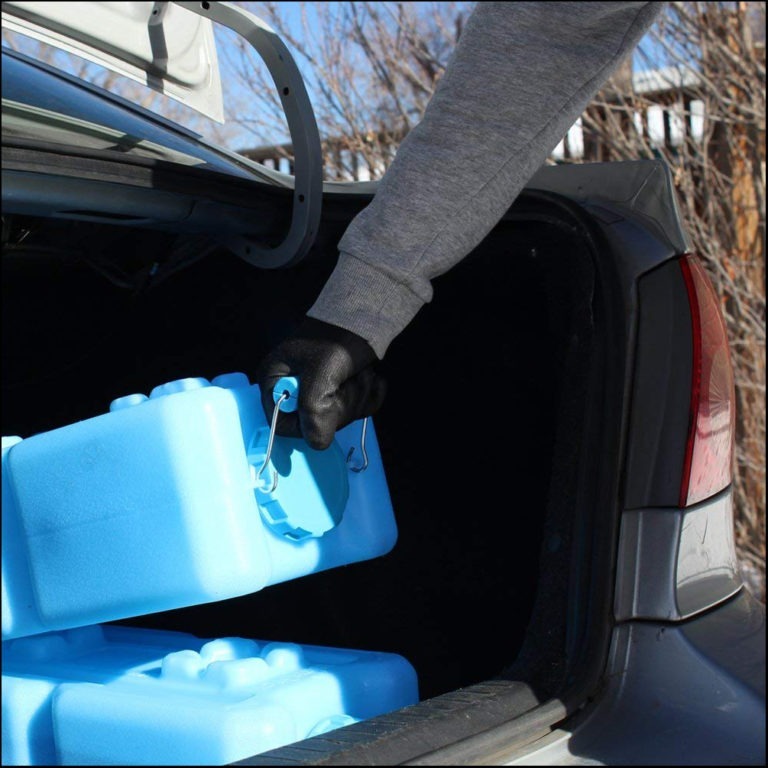 The 1.6 gallon brick is too small for any proper water storage… But you might want to get one for the trunk of your car. In case you get stranded away from your supplies. 1.6 gallons will give you about two days to get back to your main base. How many Waterbricks should I buy? When prepping, you should have at least 15 gallons of water per person stored and ready to use in your home. This is about a 2 week’s supply of water. It will last you through 99% of all emergencies and disasters. Your biggest problem with long-term water storage is the mold/algae buildup in the water. To avoid this, make sure to wash the inside of the Waterbrick with soap and rinse with household bleach afterwards. Adding a small amount of bleach in the water will prevent the algae buildup. I have also used chlorine pellets and food-grade (35%) hydrogen peroxide, but prefer the household bleach because it is cheap and simple. If you cleaned the container properly before filling it, there will be no issues storing water long-term. Still, it is a good idea to refill and drain your containers at least once per year. If you want to keep them outside for a longer time (2-3 months in non-freezing weather), I would put them on a pallet and cover with GOOD quality tarp. This way, your Waterbricks will be protected from direct sunlight. Note that Waterbricks can’t be used to store flammable liquids like fuel… The plastic will fall apart in a few months if you do that. I haven’t had this problem, but multiple users have reported their Waterbricks leaking. If yours does leak, try applying some cooking oil with your finger around the top of the opening of the container. Also make sure that the gasket is in the right position. Bottom Line: If your unit is defective, give a call to Waterbrick and they will replace it free of charge.